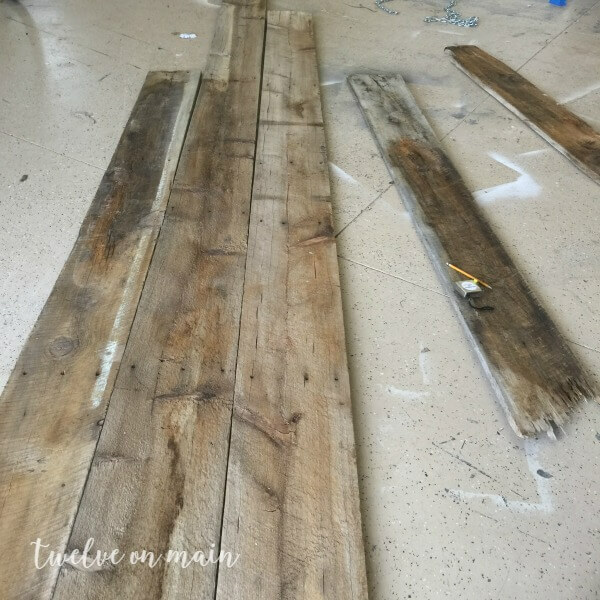 Everyone knows I am a sucker for reclaimed barn wood. Today’s post is exactly my kind of project. 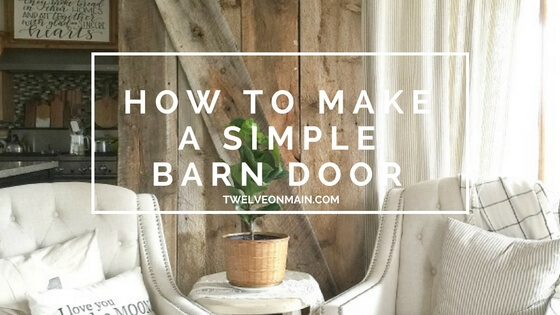 I want to show you how to make a simple barn door. I often have some secret spots where I have been able to find old barn wood. The wood that I used for this project was actually old 1 by 12 pieces of wood that had been sitting out in the sun for gosh, I don’t know how long. Each board was also about 15 feet long, so I knew I could make something cool. Now, the real reason why I decided to build a barn door, and use it as a backdrop instead of a functional door. I have this spot in my family room where my kitchen cabinets end, and there is a strip of drywall, and then my french doors. It has always been a difficult spot to decorate because I like to decorate behind my couches and there has always been a couch in this spot. 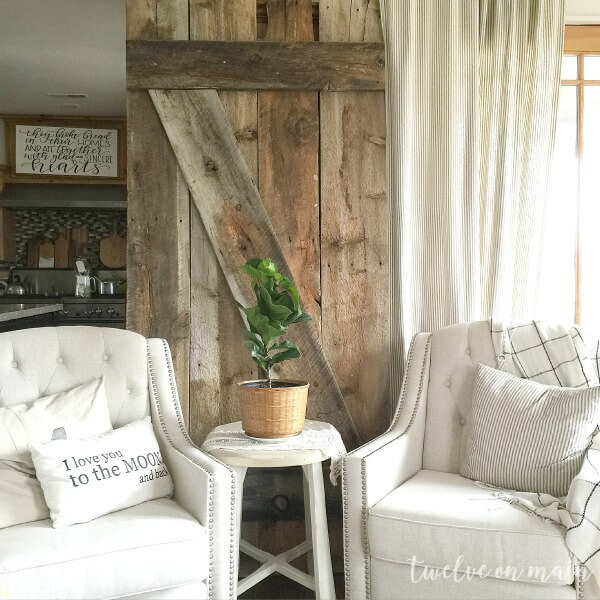 I decided to build a barn door that I could place up against the wall behind the couch or chairs to pull the space together and clean up the disjointed look that was going on. 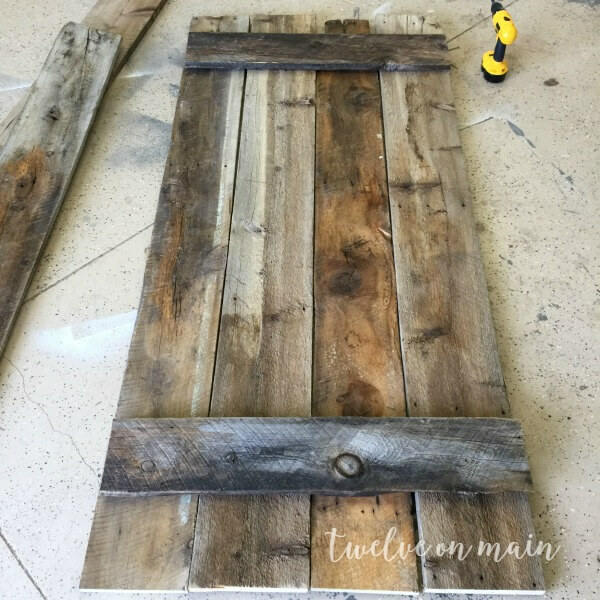 This barn door was super simple to make. Like, it took me literally less than an hour, and that was with a few stops to wrangle a few fighting kids, and feed them a quick lunch. I started out my cutting 4 boards at 8 feet long. I laid them on the ground in my garage and arranged them next to each other. I then measured the width of the four boards which was 48 inches, since they were 12 inches wide. I then cut two piece of board at 48 inches. These will serve as the horizontal pieces. I measured 12 inches down from the top and 12 inches up from the bottom and screwed the two horizontal pieces into the vertical pieces. You need to make sure you secure each of the vertical boards. The last step is to attach the cross piece. I did this by cutting one end at a 30 degree angle with my miter saw. I then measured on a diagonal to the other corner and then cut it at a 30 degree angle on that end. Then it was as simple as securing that diagonal piece onto the barn door. This piece is what really strengthens the door. 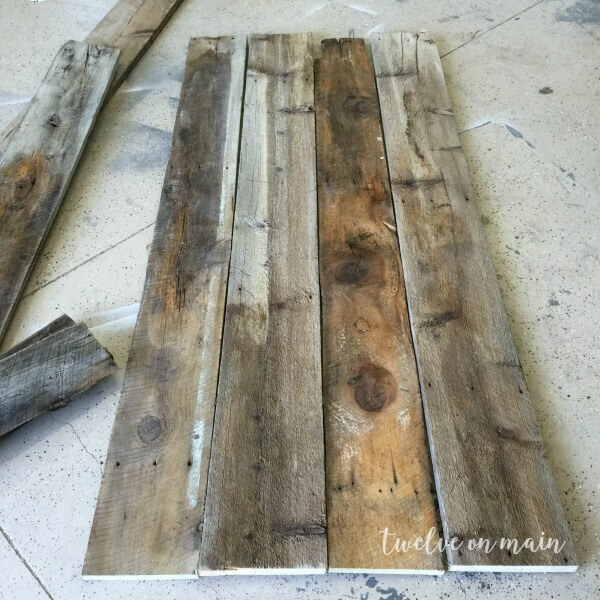 I decided to paint one side of the barn wood white, now don’t get mad, I left one side raw, so I am able to rotate it depending on my mood, which changes all the time. What do you think of those chairs? Can you believe I got them from Lamps Plus? You can also find that lovely fiddle leaf fig tree on Amazon! 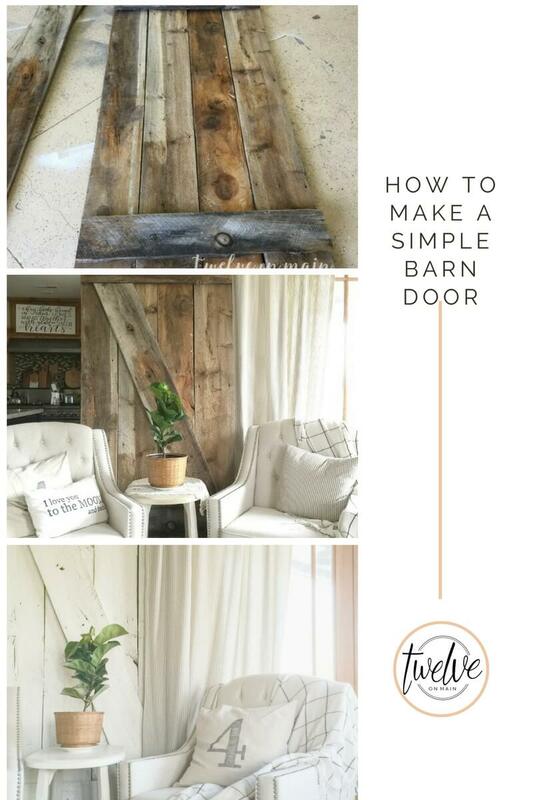 What do you think of this easy barn door? What a beautiful door. Can I do that? Looks easy to do. I need the mitter saw. Thanks for the tutorial. That looks awesome! Thanks for sharing at Home Sweet Home! 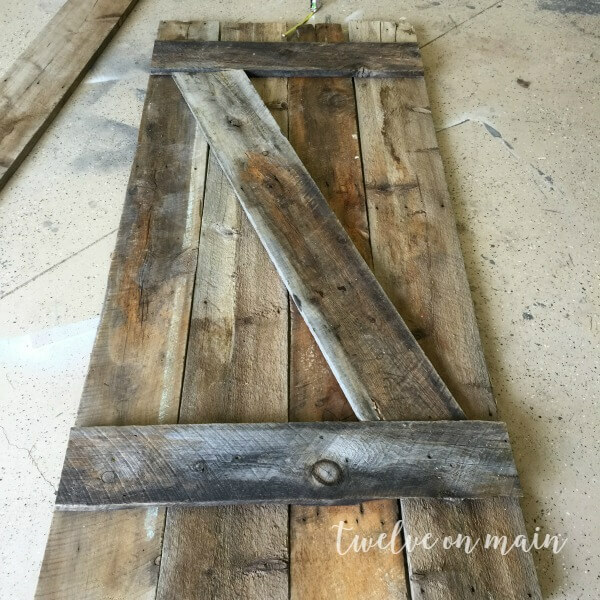 What a great and doable barndoor project! I have the perfect spot for one! Thats so great! Thanks so much for stopping by! Looks terrific and you make it look so easy! 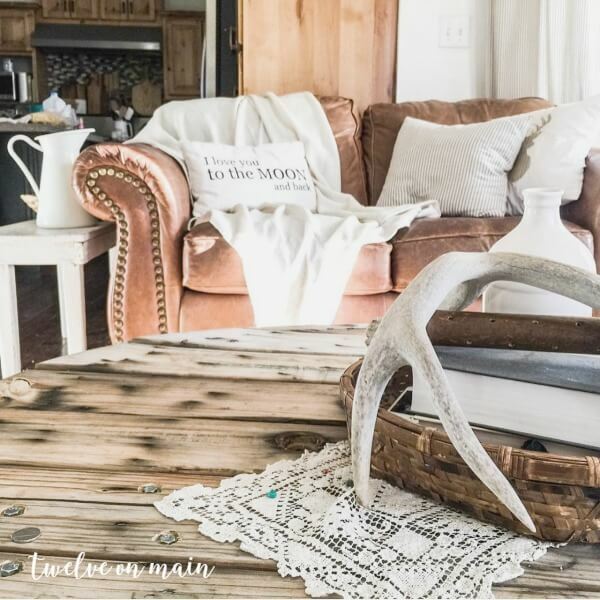 Featuring your barn door tomorrow night at our Best of the Weekend Link Party! Thanks so much for sharing and linking with us. I love your style of decorating, thank you for sharing. ???????????? Your home is beautiful. 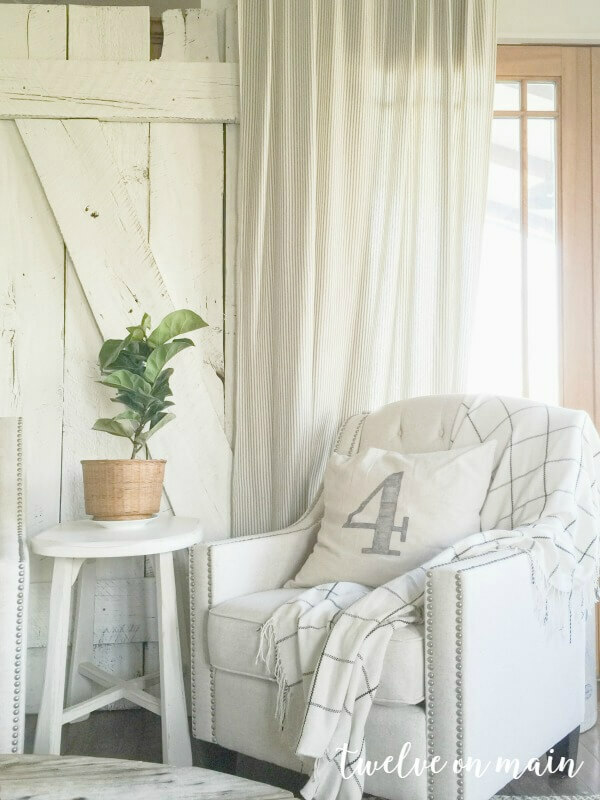 Is the barn door propped up behind the chair or is it mounted to the wall? I’d love to see how you decorated the space from the backside. Is there a photo somewhere that I may have missed? Thanks so much Rena! I believe if you check out my summer or spring home tours you can see the space from the backside!